Android and iOS are increasingly gobbling up marketshare from the traditional portable gaming options according to new figures from Flurry and NPD. Back in 2009 iOS held a 19% share of portable gaming revenues, but a year later that figure had jumped to 34% whilst Android also entered the frey with a 9% share. That's bad news for Nintendo, which saw its DS's share of revenue drop from a very commanding 70% share in 2009 to 57% last year. Now to be fair the figures shown here are only for the current portable options and don't factor in newer options like the NGP and 3DS. Even so it does suggest an upward trend for smartphone gaming. 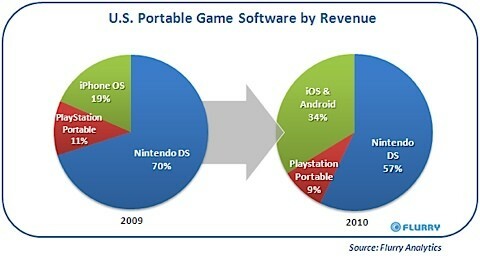 To put this into greater context though let's look at the overall games market in the U.S. Here we see a different story with the overall portable gaming revenue share (both smartphones and dedicated portable options) actually decreasing from 2009 to 2010; from 29% to 24%. 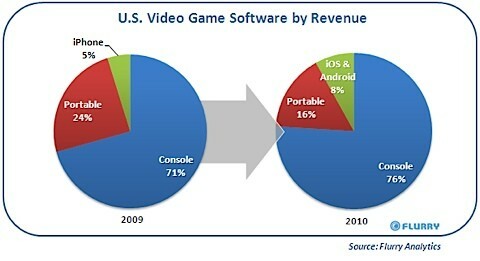 That comes about as consoles increased their share of revenue from 71% in 2009 to 76% in 2010. So even if the likes of Android and iOS are grabbing more revenue from the portable market the overall games amrket is still very much dominated by consoles and if anything portable is losing out. Hit read more for another chart.